Sunday 6th January saw players, parents, sponsors and key stakeholders in the junior game celebrate the success of players and teams within the Cricket Wales pathway at Sophia Gardens during the annual caps presentation. All players part of the day join an exclusive and proud club that can all say they have represented their country – a huge honour and one that they can be justly proud of. The Senior Women’s squad were invited to celebrate their most successful ever season in 2018. They finished third in the Royal London 50 over competition narrowly missing out on promotion to Division 1 behind Sussex and Surrey. They finished runners up in the Vitality T20 blast winning 7 out of 8 fixtures gaining themselves promotion to Division 1 for the 2019 season. 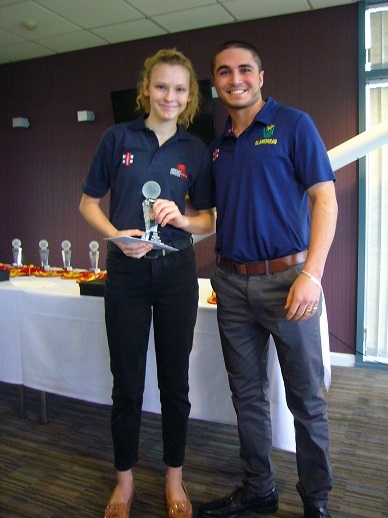 Aimee Rees Head of Women & Girls said “It was excellent to see the successful T20 squad at the presentation receiving the recognition they deserve. The girls work incredibly hard, they support each other on and off the field and enjoy each other’s success. They all possess high skill levels but the team spirit they possess has got them over the line in many tight situations I am very proud of them all. Special presentations were made to Ffion Cartwright and Rebecca Struthers who have retired at the end of the 2018 season. Ffion received her commemorative 100 cap as she made 104 appearance for Wales Women during her career along with a signed shirt form the whole squad. Rebecca who made 114 appearances in her career, received a signed shirt after being presented with her 100 cap in 2017. Gabby Basketter played in all 14 1st team games scoring 542 runs at an average of 45.17. Gabby scored a T20 century in the final fixture against Northants off 67 balls to finish our successful T20 campaign and put the icing on the cake to a very special day. She had four other innings of scores of 50 and above. Opening the batting with Rachel Priest was a great experience for Gabby and she definitely played with aggression and freedom. Gabby also contributed with the ball taking 17 wickets with her accurate off spin. Gabby is a very enthusiastic member of the squad and often helps out on and off the field. She is also very dedicated to her coaching and bringing through the next generation of welsh players. 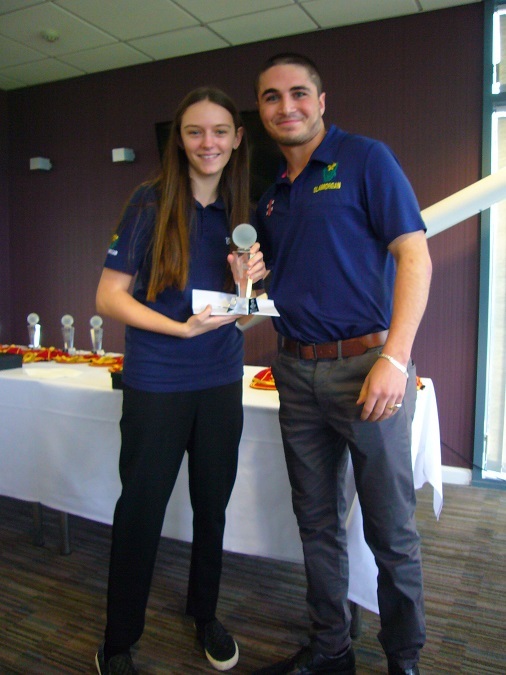 Alex played in every Under 17 fixture and scored 455 runs scoring her maiden century of 111 against Gloucestershire. Alex is an exceptional fielder as well as a top class batter her enthusiasm and commitment to cricket is exceptional. She is an excellent role model for the other players in the under 17 squad and whole pathway. She has been part of the Glamorgan Academy and ECBs south West Regional development centre for 3 years. Alex was given the opportunity to work with the Western Storm Kia Super League squad for a week during their 2018 campaign for her to see what the next step is in her career she was one of only two girls to get this opportunity. Played 25 games, 11 of which were T20s. Lost 1 game to the weather. Sophie Thomas 65no v Essex, 82 v Worcestershire, containing 8x4s & 4x6s. Savanna Dickens 52no v Shrewsbury School, 62 v Gloucestershire. Highlight of the season was our trip to the Malvern Festival. We played on four days, with two T20 game on the first day then three 40 over games. The opposition were Ireland, Somerset and Essex. The U15s had four new caps. So this year the U13s changed from a structured competition to friendly fixtures which allowed the girls to play more games against a wider range of teams, giving the girls more opportunities to play and against opposition we’ve never come up against. I believe with the highly skilled group of girls we had this year if it was still in a league format we would have qualified through to finals. The girls bonded and gelled so well as a team which no doubt showed in their performances throughout the year. I’d like to thank the players and the parents for their efforts this season. For their dedication, support and for travelling the across the country. This year we played 22 games, more games than the previous season which has also led to a few more grey hairs than I had at the start of the season. We came up against some strong opposition, but the team always took away positives and negatives from each game to work on. The progression of the girls became evident as the season went on and the wins started coming and their game awareness developed more and more. In total we had 5 wins and 17 losses. Despite having a large squad, they’ve all made some friends for life and all of the girls really came out of their shells, at the first game words were hard to come by and by the end it was a battle to get a word in. A big thank you to all the parents, players and supporters, there were some very long journeys, especially the one to Preston for it to get called off at 8am. Without their continued support none of it would be possible. So onto player of the year. This player has come on massively over the last season. At this age her bowling has been lethal, has great ability to cover a boundary and throwing herself around the field has been fantastic to watch. She has taken 11 wickets with best figures of 2/5 and scored 80 runs and took 3 catches. The John Derrick Award was presented to Bethan Gammon. In the last five years of John’s coaching career he genuinely loved working in the girls environment. He would say regularly that the girls are like sponges, they take in everything you say and have a genuine desire to get better which was really refreshing. He was adamant that the girls should have exactly the same opportunities as boys. John was a great believer in players working as hard as possible in training and doing everything they could to be the best player they could be. He believed in playing the game hard but fairly and once the game was finished, you didn’t get too down or upset if you lost there would be another opportunity in the near future to put things right. We hope that presenting this award annually will allow us to remember his passion for the game and the exceptional man he was. Bethan fully deserves this award, she has an incredible attitude towards training and playing. She trains incredibly hard, has a level of determination rarely seen at an amateur level. She has a competitive streak that is undeniable, but has been asked to do 12th man duties on a number of occasions for the senior team and has shown incredible enthusiasm for a role most dread. Bethan’s attitude and determination to be the best and person she can be is sensational. A combined effort of 50 years within the age group squads is a phenomenal achievement and one that Bob Miles and Peter Davies were rightly recognized for on Sunday. Bob has been a stalwart of the U17s, working with generations of young cricketers for up to 30 years. Alongside a host of different coaches, Bob has given a huge amount to Cricket Wales and his bowed out in style with an emotional review of the 2018 season. Peter recounted his one regret of not overtaking Bob’s service (by a year) but made an equally moving speech culminating in the presentation of the U11 Welsh caps. Peter’s passion for the game remains as strong as ever and he can look back extremely fondly and proudly of the experiences he has cultivated for young cricketers up and down the country. Cricket Wales owe both men a tremendous amount of gratitude and thanks for their persistence and endeavors over the years and we hope to keep in touch with both of them as the game moves forward at an exciting pace. Joshua Andrady claimed the award after a strong season, particularly with the bat. Hundreds at championship level have enabled Josh to finish his time with the 17s on a really strong note and we all look forward to seeing him challenge for a place in the Wales Minor Counties as he moves onto University. Ben Kellaway enjoyed a fine season for the U14s & U15s, leading the way with bat and ball, producing a number of match winning contributions when the game was in the balance. Ben was unfortunate not to make the final Bunbury squad a year early, but dealt with that disappointment in the best possible way by continually performing ad elevating his game to a place where an invitation to the Glamorgan Academy was inevitable. 2019 will be an important one for Ben to continue his development and push towards higher honours. No one in Wales scored more runs at junior level than Callum Nicholls. The run machine averaged over 200 for the U14s and backed that up with two sparkling hundreds for the U15s, including sharing a record opening stand of 242. Callum was also rewarded for his fine form with a place on the Glamorgan Academy and his ability to grind down opposition bowling attack’s will be one of his most potent attributes as he gets older. Callum is also in for a big 2019 as he pushes for Bunbury selection. Whilst the 13s enjoyed a mixed season in terms of results, their attitude and persistence was clear to see. None more so than Cian Davies whose leadership qualities are developing all the time. Cian was a key contributor with bat and ball and will continue to be a handful for opposition teams for many years to come. Awarded with a place on the Glamorgan Junior Academy, Cian thoroughly deserves his award and will want to build on his form going in 2019. The 12s also experienced an inconsistent season with plenty of useful learnings to be had. Mathew Johns however, was the leading light for the team across the summer with a number of quality performances including 94 vs California, 76* vs Cornwall and 6-11 vs Cornwall. The promising all rounder is working hard on his game in the Glamorgan Junior Academy as he pushes for another successful season. Gruff Owen enjoyed a fantastic season with gloves and bat last summer, amassing over 1000 runs at regional and national level. Gruff consistently made match winning scores and also smashed 111* vs St Stithians and 82* vs California for the U12s. Possessing a rare ability to dominate spin bowling at such a young age, Gruff thoroughly merited his place on the Glamorgan Junior Academy and is an exciting keeper/batsman to watch in 2019. Named after the former Glamorgan all rounder and former CEO of Cricket Wales, the award goes to somebody that embodies the values that Cricket Wales stands for. Steffan Crimp (U15s) was the worthy recipient this year. Steff is somebody that may not appear the flashiest of players, but he was on the most important cogs in the 15s reaching the national quarter finals with his selfless play, steely will to win and desire to get the best out of himself and others. Steff was not really on the cusp of a Bunbury trial early on in the season, but his maturity and improvement over the course of last summer was plain to see. He has a strong tactical reading of the game, conducts himself outstandingly and is a leading light to any young cricketer looking to do the same.